I didn't have a real good day on Saturday. I went down to Rosegill with the idea that I would get out in the woods with my chainsaw, clear the old road to Urbanna with the Bush Hog, and burn some calories. My old McCulloch chainsaw is unbelievably powerful, but it's now 25 years old and getting to be very high-maintenance, so I asked Christopher Stanley if I could borrow his saw. Christopher, Angela and friends Claire and Matt were using our house at Rosegill, so he was going down anyway, and throwing the saw in the car was no big deal. The tractor was low on gas, so I drowe it into town, filled it up and pressed the starter button to start the tractor again. Nothing. Nada. On one attempt, I did get a slight groan out of it, but then it fell silent again. Geez. There I was, marooned in town with a dead tractor. The gas station attendent pronounced it to be a dead battery. Fortunately, I had my cell phone with me, so I got through to Angela at Rosegill. She was going to get Christopher to come over and save me. Then a guy pulled up in front of the store across the way, and he had jumper cables. I flagged down the first pickup truck coming through town and the driver was great. We soon had the tractor running again. Small towns are wonderful. As I motored out of town, I got Angela on the cell phone again and told her I was okay. Of course, I realized I would be operating at some risk in the woods. It's easy to stall the tractor when you're in an aggressive de-struct mode with a Bush Hog. I had better be careful. So I plunged into the jungle of vines and brush, and I was quickly making good progress. 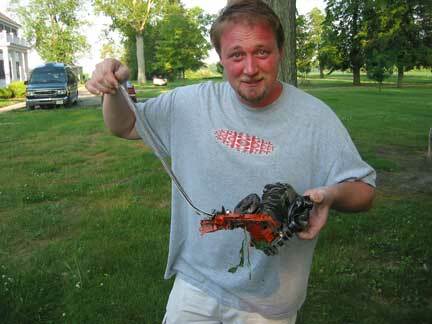 When a fallen tree was in the way, I jumped off the tractor, fired up the saw and cut my way through the brush. Then I was back on the tractor, going forward and back clearing out the brush, when I noticed something orange in the brush. It was Christopher's chainsaw, and it was beat up very badly. Obviously, it had a brief experience under the Bush Hog. It looked beyond repair, but I put it back on the Bush Hog and continued to work. Just minutes later, I noticed the grass was on fire behind the tractor, and there were pieces of Christopher's chainsaw in the grass. This time when I retreived the saw, there wasn't much left. There were pieces of chainsaw all over the place. Then I noticed the gas cap of the McCulloch was missing, and you can't get parts for the saw anymore. My bag of tools for the chainsaw was missing as well. I paused to reflect on my situation and the way things were going. Time to quit. So I beat a strategic retreat back, and on the way out, a large branch caught in the Bush Hog and I dragged it down the highway. When I turned into the main entrance road, I noticed that Christopher's chainsaw, such as it was, had fallen off again. I stopped the tractor. Of course, with the dead battery, I couldn't stop the engine. So I let it idle. I jumped off, cleared the branch off, put the chainsaw relic back on the saw. During all of this, the tractor was slowly coasting forward on the slight downhill grade. It wasn't going very fast, but as I approached the tractor to hop on it, I noticed my left shoelace was loose and tripping me up. Geez, if I blow it and get run over by this tractor, I hate to think what people would say about me. But I made it safely back on the tractor, and drove back to the hangar without incident. Roy Bowman had just landed in his airplane, and as I told him about my experience, I noticed that the McCulloch was gone. Roy explained there was nothing wrong with the battery, it was just a loose connection, and you have to wiggle this wire. Christopher, Angela, Claire and Matt drove up, and we all got to laughing about what had happened. All that was left of his chainsaw was the combination screwdriver/wrench, and I returned to to Christopher graduation-style with a handshake with the right hand while passing the wrench with the left. It slowly dawned on me that this saw, which belongs to Roy Bowman, is quite different from the Bush Hog, and it doesn't have the 'fence' at the tail end to keep things from falling out. Roy started wondering about what shape the blades were in. I got the hell out of there. Christopher gets his chainsaw back.